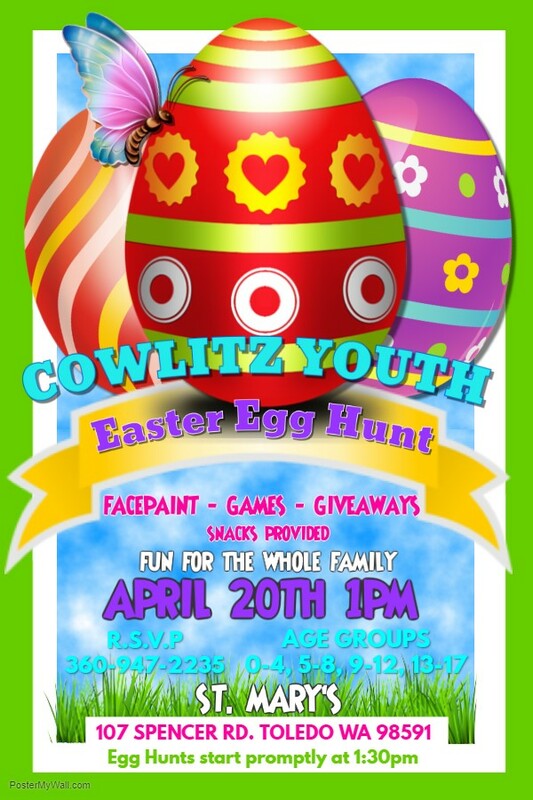 The mission of the Cowlitz Youth Program is to enrich the lives of youth and the Tribe through traditions that teach respect, honor and culture by connecting them to the Elders, Cowlitz Tribal people, and history, traditions and culture of the Cowlitz Indian Tribe. 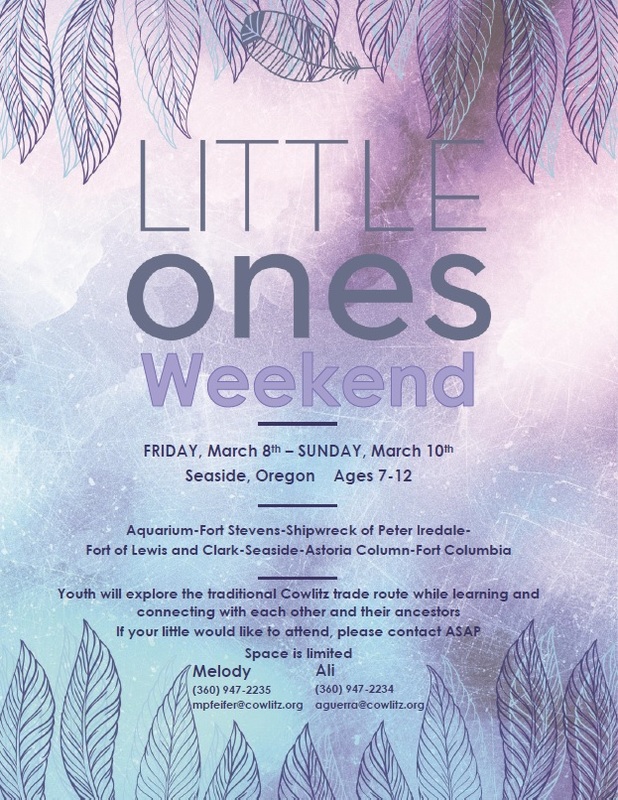 Youth between the age of 7-17 years old, enrolled in the Cowlitz Indian Tribe and/or direct descendent of a currently enrolled parent. Youth living in the same household, family joined by marriage and/or adoption with a parent currently enrolled in the Cowlitz Indian Tribe. 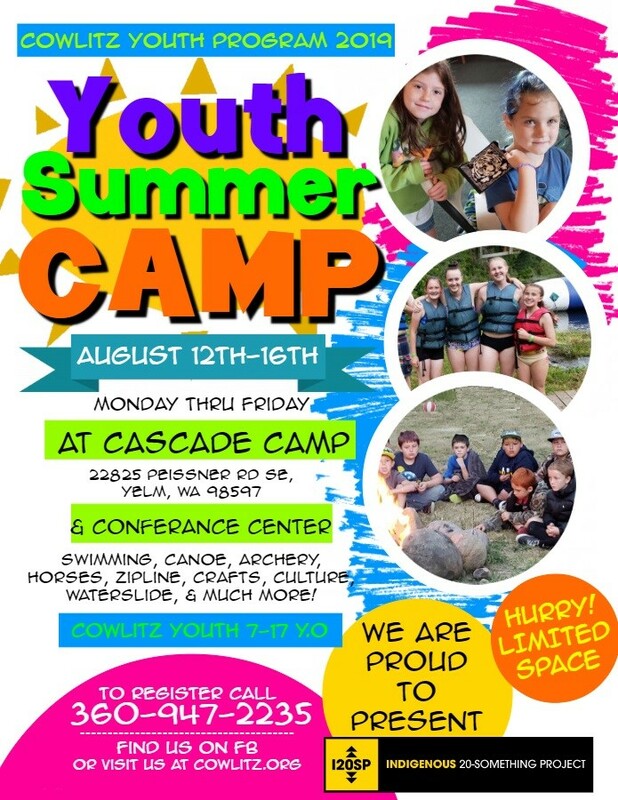 Youth enrolled or direct descendent of a Federally Recognized Tribe currently receiving services from the Cowlitz Indian Tribe. Employees of the Cowlitz Indian Tribe direct children. Activities listed below (Youth under 7 years of age are welcome accompanied by a responsible adult). 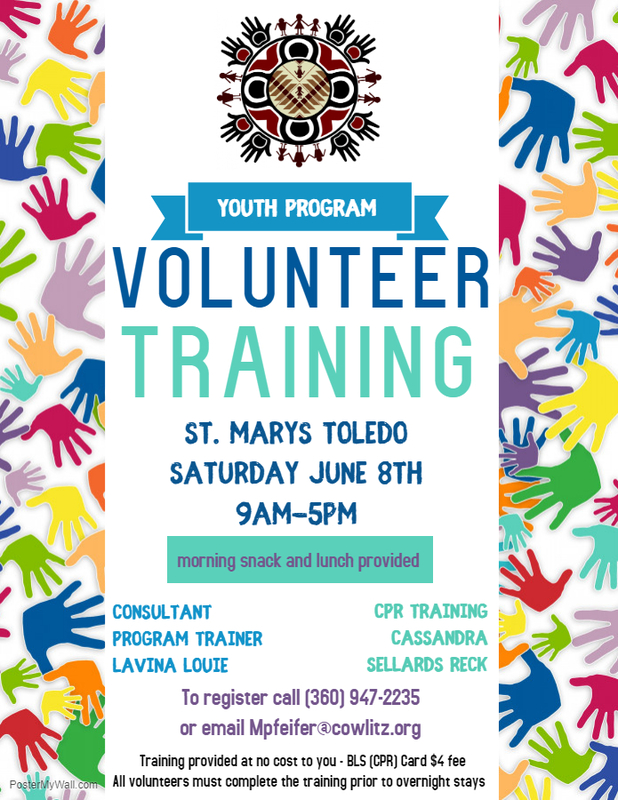 Volunteer Training June 8th | 9a-5p St. Mary's Youth Volunteer Training (FOR ADULT VOLUNTEERS) Check out this flyer for more details and registration information! Tribal Canoe Journey July-August Bellingham, WA Tribal Canoe Journey to Bellingham, WA with Hosting protocol by Lummi Nation. 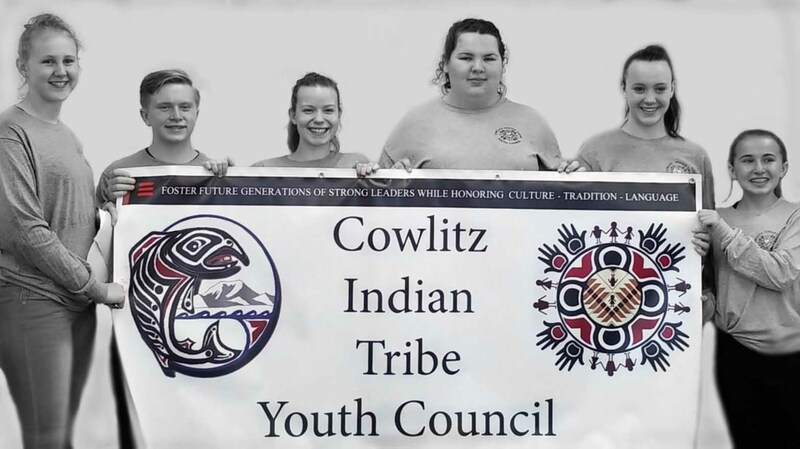 The purpose of the Cowlitz Indian Tribe Youth Council (CITYC) is to foster future generations of strong leaders while honoring culture, tradition, and language; and to promote mental and physical well-being of Cowlitz youth. The CITYC strives to act as a voice while modeling positive attitudes and behavior for Cowlitz youth. CITYC also serves as an ambassador for Cowlitz youth when youth issues are being discussed. The CITYC ensure youth have input with the Cowlitz Youth Board leadership on decisions and policies, guidance on strategic planning, and vision for the future. The council also works to bring innovative ideas and opportunities to generations of the Cowlitz People. 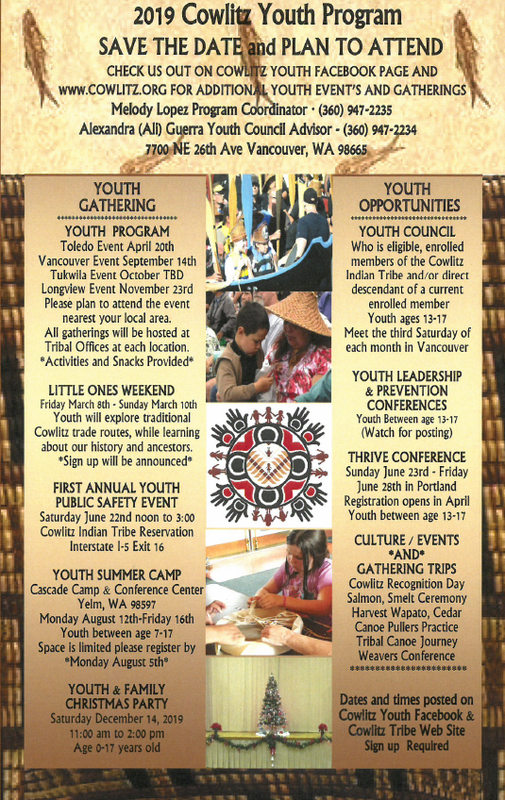 Youth Council Eligibility: Youth who are enrolled members of the Cowlitz Indian Tribe and/or direct descendants of a currently enrolled member | Youth between the ages 13-17 | Must be able to perform CITYC duties.